The Comet ISON shines like a cosmic skyrocket in a new video from the Hubble Space Telescope as the icy wanderer, which some astronomers have billed as a potential "comet of the century," streaks through our solar system at a staggering 48,000 mph. The new Comet ISON video, which NASA released Tuesday (July 2), is a time-lapse view created from images of the comet obtained using the Hubble telescope on May 8. At the time, the comet was about 403 million miles (648 million kilometers) from Earth and crossing between the orbits of Jupiter and Mars. NASA officials likened the comet's extreme speed to a skyrocket on the Fourth of July. The Hubble Space Telescope captured this view of Comet ISON, C/2012 S1 (ISON), on May 8, 2013 as it streaked between the orbits of Jupiter and Mars at 48,000 mph. This annotated view shows the comet's scale and direction of motion. The blue hue of ISON in the new video is actually a false-color view of the comet as it appeared through the Wide Field Camera 3 on the Hubble Space Telescope. Comet ISON was discovered by amateur astronomers in September 2012 and is headed for a close encounter with the sun in late November of this year. The comet's swing through the inner solar system is much anticipated by professional and amateur astronomers because of its extremely close approach to the sun. On Nov. 28, Comet ISON will swing within 800,000 miles (1.2 million km) of the sun's surface. That close encounter could cause the comet to flare up into a brilliant night sky sight visible to the unaided eye by November. But the comet could also fizzle out in a fabulous bust, so NASA scientists and astronomers around the world are keeping a close watch on Comet ISON to see if it lives up to its hype. 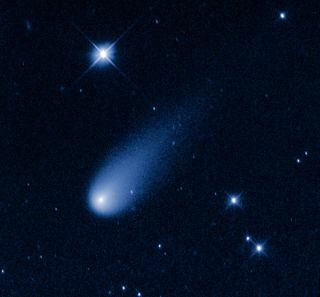 While NASA has likened Comet ISON to a cosmic firework in the new Hubble video, the comet itself is not exploding. "Its skyrocket-looking tail is really a streamer of gas and dust bleeding off the icy nucleus, which is surrounded by a bright star-like-looking coma," NASA officials wrote. "The pressure of the solar wind sweeps the material into a tail, like a breeze blowing a windsock." As the comet zooms closer to the sun and warms up, it is expected to grow, NASA officials added. ISON's tail will also grow longer over time. In April, Comet ISON's tail stretched across 57,000 miles (92,000 km) in images snapped by the Hubble Space Telescope. At the time, the comet's nucleus was estimated to be about 4 miles (6.5 km) across. Because of ISON's potential to be a spectacular night sky object, NASA and astronomers around the world have assembled a Comet ISON Observing Campaign to track the object's progress across the solar system. Comet ISON is officially known as comet C/2012 S1 (ISON) and was discovered last September by Russian amateur astronomers Vitali Nevski and Artyom Novichonok. The pair used the International Scientific Observing Network (ISON) of remotely operated telescopes to spot the comet, hence its name.